Lost Luggage (Loss/Theft) – Due to damage to, or loss of, or theft of your checked or stored baggage or personal items by a common carrier, or while stored with your hotel. It will also usually include coverage for the replacement costs of travel documents, and sometimes bag tracking. When comparing short-term plans, some clients are interested in seeing what benefits each carrier has in case they might need to replace lost or stolen property in the course of their travels. Depending on the plan, this can vary greatly. If you are worried about theft or loss due to where you plan to travel we’d recommend our Trawick Safe Travels plan. 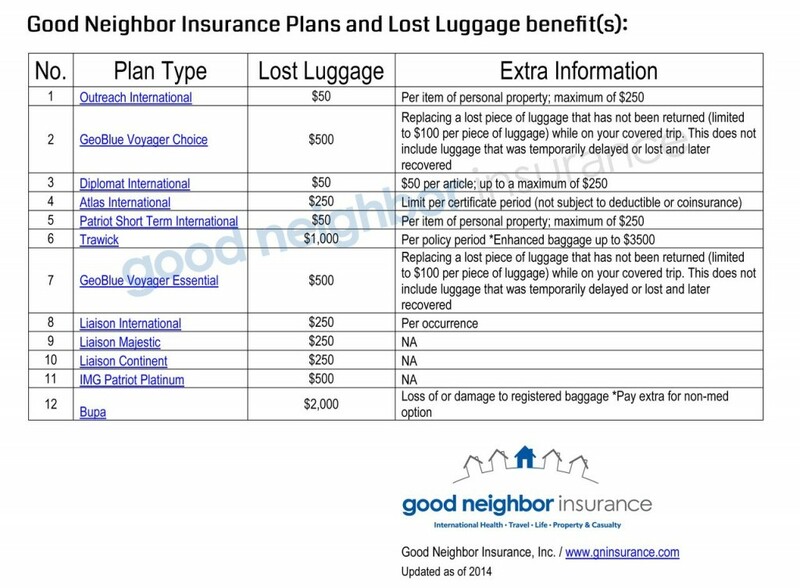 They also have a rider to up the limit for more expensive equipment you may be taking with you.You may also want to consider BUPA or if you’d like having stronger medical coverage and benefits in addition to lost luggage, check out our IMG Patriot Platinum Plan.